May 2010 (San Diego's East County) -- Is the simple task of choosing wedding cutlery with your betrothed establishing a basis for irreconcilable differences? Planning a wedding can be a nerve-racking ordeal. From researching the perfect florist to booking a reliable caterer, someone must attend to every detail of your wedding day. East County Magazine has taken the guesswork out of this process by handpicking local vendors in eight important categories. After all, the wedding march should not be a call to arms! 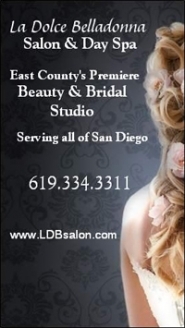 La Dolce Belladonna Salon & Spa: East County’s premier bridal and beauty studio will pamper you from head to toe on your wedding day—hair styling, updos, manicures, pedicures, body wraps, waxing, teeth whitening and air brush makeup artistry. http://www.ldbsalon.com/. I Heart Calligraphy: A practiced calligrapher, Sade can design 100 invitations per week for your special day. Payment in full before commencement of project. (619) 995-8986, www.iheartcalligraphy.com. Arc de Belle: Traditional or modern wedding canopies and arches can inspire the desired décor of any venue where the couple ties the knot. (858) 405-1207, www.archrentals.com. Authentic Flavors Catering: A producer of world-class culinary events, wedding menus include butlered hors doeuvres and seated entrées. 7004 Carroll Rd., San Diego, CA 92121; (858) 404-0606; www.sdauthenticflavors.com. Cupid’s Catering: Owner Gloria Bautisa prepares creations with a pinch of love served up with a dash of romance—from chocolate fountains to fruit peacocks, your appetite will be whetted for more. 1473 Hidden Mesa Trail, El Cajon, CA 92109; (619)654-1111; www.cupidscatering.com. 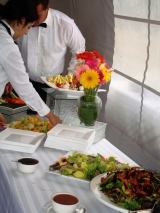 Festivities Catering and Special Events: A gracious staff, full bar service, and even event coordinators and chefs are on hand to provide impeccable fine cuisine and wedding services. 9558 Camino Ruiz, San Diego, CA 92126; (858) 586-2121; www.festivitiescatering.com. Spicy Creations Catering: Utilizing original recipes and the freshest ingredients, menus may include cake cutting services, linens, silverware, champagne fountains and more. (619) 227-3946, www.thespicycreations.com. 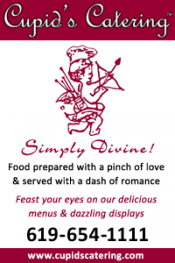 The Wild Thyme Company: Trust is paramount with this innovative caterer. Globally inspired menus and personalized event design are its forte. 7163 Construction Ct., Suite B, San Diego, CA 92121; (858) 527-0226; www.thewildthymecompany.com. TK&A Custom Catering: Four wedding menus—Californian, Diamond, Jewel, Mediterranean—promise delectable cuisine. Other services include brunch and valet service. Gay and lesbian clients welcome. 9558 Camino Ruiz, San Diego, CA 92126; (858) 444-8822; www.tka-catering.com. Becks Entertainment and DJ Services: Wedding DJ with over 300,000 song titles offers three distinct wedding packages with options such as custom music editing, lighting package and video montage display. (619) 246-2325, www.becksentertainment.com. Injoy Entertainment: Weddings are a passionate point of emphasis . Package includes four hours with live DJ, state-of-the-art sound system, lighting ensemble and more. 6278 Childs Ave., San Diego, CA 92139; (619) 523-1140; www.injoyent.com. Nights of the Sound Table: With nearly two decades of hospitality and radio experience, Nights of the Sound Table has provided DJ entertainment coast to coast. With coupon on ECM’s “Hot Coupons” page, military personnel can receive a 50% discount on any event booked.(619)370-7746. www.nightsofthesoundtable.com. Pam's Productions DJ's: Over 15 years of DJ experience, receptive full-timer designs the wedding experience from the bride’s perspective. Demo video may be requested. (619) 579-8192, www.partypam.com. San Diego Festival Music: Founded by concert violinist Mary Karo, who has appeared with artists ranging from Bob Hope to Burt Bacharach, San Diego Festival Music provides classical string trios, popular wedding tunes, Jewish ceremony music, and special arrangements. (619)660-8184; www.sandiegofestivalmusic.com. Sound Prodigy: Sought-after mobile DJs whose entertainment is highlighted by songs from nearly every genre, lighting and visual effects, games for all ages, and more. (619) 972-6086, www.soundprodigy.com. 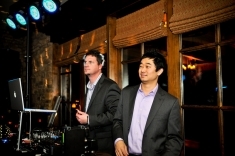 Soundworks DJMC: Highly professional DJ provides only wedding entertainment. Helpful and low-stress service, multiple sound systems, and vendor referrals are major selling points. (800) 660-1369, www.djsoundworks.com. bouquets, floral cake decorations, ceremony arrangements and centerpieces designed to fit any budget. El Cajon and La Mesa shops, (800) 460-5501, www.allensflowers.com. other flowers. 9740-E Mission Gorge Rd., Santee, CA 92071; (619) 562-3091; www.santeeflowers.com. Homeland Florist: Serving San Diego and East County for 85 years, Homeland Florist offers beautiful wedding flowers at reasonable prices. 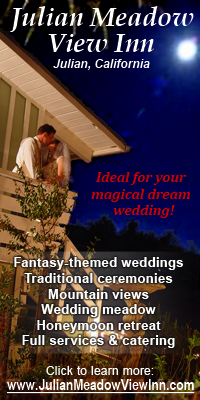 See websites for wedding photos. Jasmine Creek Florist: Family owned and operated El Cajon flower shop that produces creative arrangements for all wedding needs. 753 Jamacha Rd., El Cajon, CA 92019; (619) 588-2377; www.jasminecreekflorist.com. Michael’s Flower Girl: Showcased in magazines, this award-winning florist has an online compendium of bridal flowers to adorn every stage of the wedding experience. 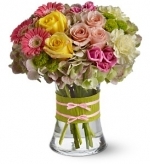 10450 Friars Rd., Suite #V, San Diego, CA 92120; (619) 516-5544; www.michaelsflowergirl.com. Twice-Touched Treasures Floral Preservation: La Mesa shop specializing in floral preservation, including the transformation of bouquets into heirlooms. 4482 Calavo Dr., La Mesa, CA 91941; (619) 442-7696; www.twicetouchedtreasures.com. Bride Couture: Designer gowns fully inspected by an expert staff at 50-70% markdowns. Online catalog with wide-ranging inventory. 13443 Standish Dr., Poway, CA 92064; (858) 842-2220; www.bridecouture.com. Bridal & Tuxedo Galleria: An exclusive selection of bridal gowns, veils, tiaras, bridesmaid dresses, tuxedos and jewelry is carried. 4242 Camino Del Rio North #14, San Diego, CA 92108; (619) 281-GOWN; www.bridalandtuxedogalleria.com. Prevue Formal and Bridal: Thousands of exclusive dresses in stock. Strict policy against the sale of the same dress twice for the same event. 5500 Grossmont Center Dr., La Mesa, CA 91902; (619) 589-2100; www.prevueformalandbridal.com. Sparrow Bridal Boutique: A La Mesa treasure, this retailer specializes in new and gently worn gowns for the chic bride-to-be. Birdcage veils, vintage jewelry, garters, ring pillows and more are all reasonably priced. 8283 La Mesa Blvd., La Mesa, CA 91942; (619) 985-6525. www.sparrowbridal.com. Va Lena Valentina Couture: Custom pieces from designer Elena Ham guarantee that each gown is a work of art. 9029 Park Plaza Dr., Suite #203, La Mesa, CA 91942; (619) 463- 1518; www.valenavalentina.com. 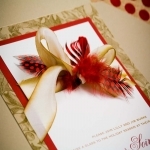 Simply Posh Design: Invitations and stationery design that may include handmade silk boxes, pouches and folios. Advance of four to six months is mandatory contingent on the order. (619) 713-1714, www.simplyposhdesign.com. AS Photography: Whether classic black and whites or vibrant color prints, this wedding photographer has the talent to memorialize your ceremony. (619) 750-4304, www.iheartas.com. Gillespie Photography: Lifelong photographic experts, this duo has been recognized as one of the top wedding teams in San Diego. Online videos and proofs are viewable. (619) 466-3627, www.gillespiephoto.com. Ivy League Photography: David Knoll was selected wedding photographer of the year in 2003 by Professional Photographers of San Diego. A PPA master photographer, he has won many national, state and local awards for his wedding images. A Harvard graduate now based in East County, he studied photography at the Brooks Institute of Photography and West Coast Institute of Photography. (619)669-5320; www.ivyleaguephoto.com. Jennifer Dery Photography: Discriminating clientele may rely on over eight years of experience photographing weddings. Wedding commission includes custom designed albums, access to negatives and more. 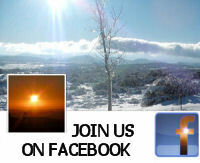 (619) 284-8875, www.jenniferdery.com. Julie Edwards Photographer: This talented artist, based in La Mesa, has photographed over 130 weddings including many at top East County wedding venues. She covers all sizes of occasions, from intimate affairs to large and lavish weddings and receptions. (619)417-7397; www.jedwardsphotographer.com. Sullivan Family Photography: Family-owned business applies a love for photography to your ceremony with six-, eight-, and unlimited-hour wedding sessions. (619) 750-1135, www.sullivanfamphotography.com. Unveiled Wedding Photography: Skilled wedding photojournalists with over 500 weddings snapped have been featured by various local media outlets and provide four packages. 10902 Avenida Benjamin, La Mesa, CA 91941; (619) 660-2712; www.unveiledwedding.com. California Carriages: Pricing of two-hour rental of horse-drawn white carriages dependent of proximity to business address—local range is $500-$750. (619) 390-8762, www.californiacarriages.com. Elite Image Limousines: Personalized wedding service in high-end limos, vintage vehicles and shuttle buses featuring a Bridal Insider discount. (619) 749-2853, www.eliteimagelimousines.com. Nstyle Limousine: White-glove service included with luxury limos and limo buses rentals. Champagne and matching napkins are available for the wedding package. (619) 866-1616, www.nstylelimos.com. Platinum Star Limousine Service: Stretch limos, Bentleys and other fine autos handled by experienced and courteous chauffeurs. (619) 337-3900, www.platinumstarlimo.com. Rolls Livery: An antique pink Cadillac limo, newer model and classic Rolls-Royces, and Bentleys are rentable. A red carpet is a wedding option; pricing from $175 to $1,900. (619) 518-7655, www.rollslivery.com. Friar Tux Shop: Supplier of wedding coats, vests, shirts and footwear for every man. Full color brochures are downloadable online and free fabric swatches are available. 5255 Jackson Dr., La Mesa, CA 91942; (619) 463-9988; www.friartux.com. Elegance on Display: Boasting over 20 years of experience, Jennifer Duarte’s affinity for wedding cake designs are unparalleled. Private tastings by appointment. 106 W. Hawthorne St., Suite “C”, Fallbrook, CA 92028; (866) 243-1865; www.eleganceondisplay.com. Flour Power: For 25 years, Flour Powers bakers have been cooking up cakes for weddings and top area hotels—from San Diego white chocolate sea shell cakes to a mad hatter cake for a unique affair. 2389 Fletcher Parkway, El Cajon. (619) 697-4747; www.floupower.com. Grove Pastry Shop: Whether the taste is for nautically themed cakes or one adorned with inky blue butterflies, this Lemon Grove shop has it all. Founded in 1947, this bakery is famed for its fillings—from luscious lemon to white chocolate raspberry mousse. 3308 Main St., Lemon Grove, CA‎ 91945; (619) 466-3277; www.grovepastryshop.com. Maya Chiang Cake Boutique: A wedding cake boutique with sensibly priced cakes that contain 100% natural ingredients. 357 3rd Ave., Chula Vista, CA 91910; (619) 498-1810; www.mayachiangcakeboutique.com. 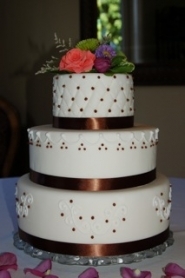 Sweet Cakes of San Diego: Fondant cakes in an assortment of flavors and fillings are a specialty. (858) 722-7923, www.sweetcakessd.com. Sweet Cheeks Baking Company: Wholesome cakes with no transfats or artificial ingredients, these desserts are a healthy gourmand’s dream. 4564 Alvarado Canyon Rd., Suite A, San Diego, CA 92120; (619) 285-1220; www.sweetcheeksbaking.com. See our story, “Getting Hitched in East County” for detailed listings of top places to get married in San Diego’s eastern region. Whether you’re looking for a serene mountain retreat, lush winery, Indian resort or Western-style ranch, East County has it all! http://www.eastcountymagazine.org/node/3271. Lars Norberg Videography: A boutique video production company that specializes in weddings. Several packages may include photo montages, cinematic features or documentary films. (310) 804-8828, www.larsnorberg.com.